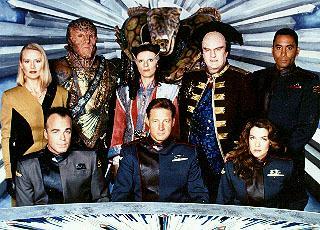 J. Michael Straczynski's epic space opera covering a five year span in the history of a space station known as Babylon 5. 68. 4-2                 11 Nov 96   Whatever Happened to Mr. Garibaldi? The voice of the Babylon 5 computer was done by script supervisor Haley McLane. The voiceovers at the end of the first season episodes were done by associate producer George Johnsen. The voiceovers at the end of the second season episodes were done by conceptual consultant Harlan Ellison.